I never used to like herbal tea, but I've changed my ways and now drink it quite frequently. Do you drink herbal tea? I really like the Oregon based Stash brand and my new favorite is their Acai Berry , it is fruity without being overly sweet ... scrumptious! What is your favorite type of tea? I love Stash's peppermint tea. I love Cream Earl Grey Tea. You can usually find it at Argo Tea. It is so good! I am actually thinking of trying to make a Cream Earl Grey Ice Cream out of it. peppermint is awesome. earl grey and SUGAR COOKIE SLEIGH RIDE by celestial seasonings. that's right, people. A delightful blend of strawberry & elderberry I used to drink when I lived in Denmark. Haven't found it here. I really enjoy going to our local herb farm which has gorgeous glass jars filled with loose herbs. It is a pleasure to mix my own combinations according to flavor, scent and colors. I also enjoy Yerba Mate. bancha or sencha japanese green tea from morning till sunset, lemon scented verdena before bed. I love tea. My mother bought me a prcelain tea set when I was little and she taught me how to seep the mint leaves from our garden in the hot water and then add honey. Mint tea is so comforting. FYI cheese cake factory will bring you out an assortment of teas with your dessert and a quaint little tea pot. LOVE IT! I like to mix tencha leaves (a sweet Chinese tea), peppermint and spearmint leaves and lemon grass. The infusion of this blend is delicious! I was only a casual tea drinker - sipping whatever was thrown my way - UNTIL I had the thought to sign up for a tea tasting & class on the history and production of tea. It really was such a huge eye-opener, and it truly makes tea such a delightful and interesting part of my life. It was an undiscovered world for me. The Tea Emporium, where I took the class, sells loose leaf, which I find fun because then you can buy like three table spoons at a time. mighty leaf tropical green tea! mmmm. uhmm tea ... green tea every day, apple tea for a special afternoons, pepermint tea for some mornings. I love peppermint. But nothing beats a teapot stuffed with fresh mint leaves! 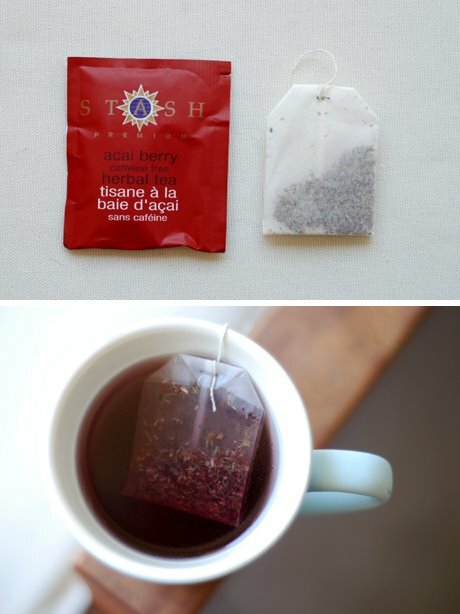 I love herbal tea! Way better than coffee any day! Anything by Yogi teas. Their Sweet Thai Delight is amazing with a little agave nectar and milk. I also love the green tea kombucha just plain. You also can't beat a good vanilla rooibos with milk. In our culture, we drink tea like its water. We add saffron and mint leaves to regular tea and boil it until it bubbles. It's like a national drink! I either drink that, or mint tea. I also drink jasmine green tea, but its not my favorite. I love Tazo's Passion. Yum! Second cup in Canada's blueberry tea.